Famous climber Alex Honnold (that's not him in the picture) scales daunting challenges solo, and with only his hands and feet, arms as legs as safety gear. 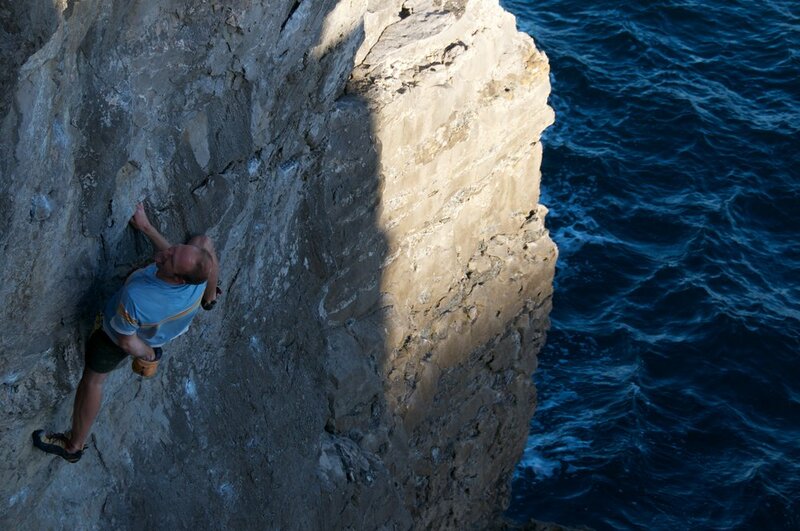 Because of his seemingly fearless ascents, the subject of what motivates him to accept the risk of soloing, for example, a thousand foot sheer rock wall is of interest to science, as well as the source of a fascinating article in Nautilus magazine. 'I think that the unique thing isn’t my ability to solo, I think the unique thing is really wanting to,' [Alex] Honnold says. His heroes were ropeless climbers like Peter Croft and John Bachar, who had set new standards in the style in the 1980s and ’90s. (Honnold was also intensely shy, which made it difficult for him to find partners for roped climbing.) He saw their photographs in climbing magazines and knew—he just knew—that he wanted to put himself in those same kinds of positions: wildly exposed, potentially deadly, totally under control. To Marie Monfils, who heads the Monfils Fear Memory Lab at the University of Texas at Austin, Honnold’s process sounds like an almost textbook, if obviously extreme, approach to dealing with fear. Until recently, Monfils says, most psychologists believed that memories—including fear memories—became 'consolidated,' or unchangeable, soon after they were acquired. In just the past 16 years, that understanding has shifted. Research has shown that every time we recall a memory, it undergoes reconsolidation, meaning we are able to add new information or a different interpretation to our remembrance, even turning fearful memories into fearless ones (emphasis added). I love that last sentence, don't you? There are of course reasons to be afraid. Is that rustling behind the bushes a threat or simply a friend walking to greet me? But once afraid, the mind becomes hyper focused, locked, unable to process other information clearly, much less creatively. And needless to say, scaling mountains bare-handed requires a clear head and creative approaches. Climbing changes Honnold by redeeming his past. It is, strictly speaking, a mind altering substance. Read Nautilus Magazine's "The Strange Brain of the World’s Greatest Solo Climber" to discover more about his amazing skill. Please remember that the price for a festival pass will go up on September 6th. Get yours today - and get this IF-branded Google Cardboard to experience the IdeaFestival in virtual reality!